I’m not going to lie, shopping for my mom is hard. She likes what she likes, so it’s hard to get her anything too out there. I kept her in mind for a lot of these ideas, but also tried to think of fun and thoughtful ideas other woman would like! All of these ideas are under $100! 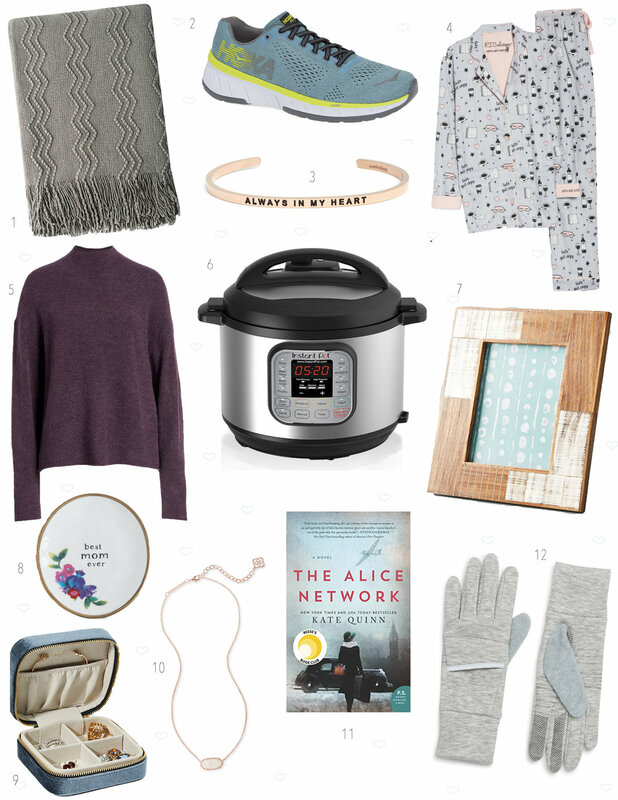 My Gift Guide for the Hostess has more ideas if she loves cooking/entertaining and my Gift Guide for Your Gal Pal has other fun options that would also be perfect for mom! Check out my gift ideas for mom below! 1) Throw Blanket - This textured throw comes in eleven colors, is super soft and only $21! 2) Tennis Shoes - I put this on my guide with my mom in mind! Tennis shoes are always on her list! She loves colorful sneakers like these. This brand is a great affordable option, if you’re looking for something under $100. 3) Bracelet - I own a few of these bracelets and the quotes on them are always so endearing. I love this quote, especially if you live far away from your parents like me. 4) Pajamas - These pajamas come in nine different prints and they are all so fun! This pair I linked have tiny coffee cups, wine bottles, sleep masks, and books on them. Stitched on the sleeve it says “Let’s Get Cozy”. Mom if you’re reading this, let’s get matching pajamas ok? 5) Sweater - This under $50 mock neck sweater comes in six colors, it’s a great basic for anyone and this brand is the best quality! 6) Instant Pot - If you’re mom loves cooking she’s probably dying to get her hands on an Instant Pot! This pressure cooker is designed to make cooking a breeze! Plus this one is under $100! 7) Picture Frame - A picture frame is always a good idea. Especially if you include a photo inside. Deliver your Christmas card in this picture frame as an early Christmas gift! 8) Trinket Dish - Best Mom Ever. This trinket dish is so sweet and is perfect to store her wedding ring on her nightstand as she sleeps! 9) Jewelry Case - This jewelry case is a great gift for someone who travels often. It organizes all of her jewelry in one space without getting tangled. 10) Druzy Necklace - This delicate necklace comes in eight colors and would be a thoughtful gift for your mother in law! 11) Book - If you’re mom enjoys reading, a book is always a good idea. This one sounds very interesting, plus it was a part of Reese Witherspoon’s Book Club picks! 12) Gloves - Another item that’s always on my moms list? A good pair of gloves. This pair has reflective details if your mom likes running in the early morning or night when it’s dark! Plus they are compatible with touch screens so she can text, answer calls, change her music etc. This blog post may contain affiliate links.